We’re an hour from a Home Depot or Pizza Hut but have a fantastic sewing shop about 25 minutes away. They have a quilt special every year where you come the first Tuesday in January and pay $5 for the fabric and pattern for a block. If you make it and take it in to show them the first Tuesday in February, they give you the fabric and pattern for the second coordinating block for free. I selected the batik option. There was also a yellow country-looking option in the same pattern. Pretty, right? 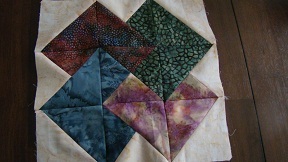 I’ve quilted before but it’s been 23 years and I was only doing straight line easy stuff at the time, like log cabin. I’m anxious to see how this all comes together and plan to make all 12 blocks for $5. 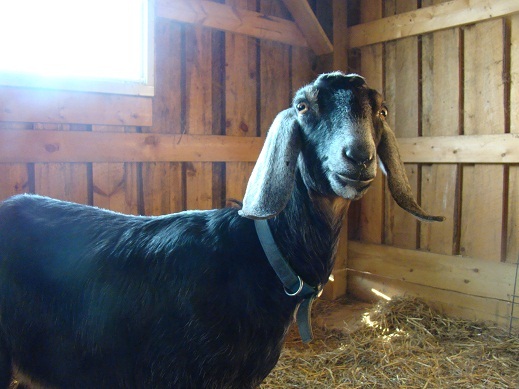 She’s a nubian dairy goat who came to our farm when one of our original nubians didn’t work out. She replaced Dulcinea, who wasn’t properly disbudded (or dehorned). We have a strict no horns allowed policy. We figured since we’re new to animal handling, we didn’t want to have to worry about getting gored. Disbudding isn’t pleasant, it’s done with a hot disbudding iron. We do it ourselves with the kids born on our farm, it’s my absolute least favorite part of farming. Sophie had two kids last Spring. She was a little skitterish before then, but got used to being handled during milking. She’s a beauty who doesn’t live up to her dangerous name at all. It’s been in the teens overnight and we’re still eating our own food. Honey, bless her heart, is still laying. The other chickens think she’s a show off. 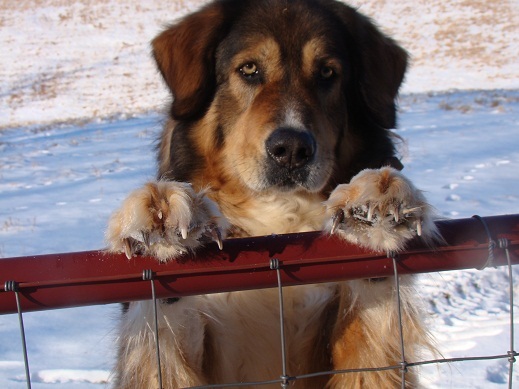 We need to get more of her breed in 2011, red sexlink. Our greenhouse (which we are currently not heating) is still producing greens in the dead of winter. 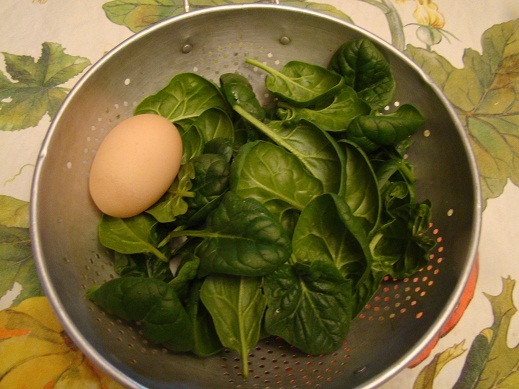 Spinach omelet, anyone? What’s better than that? FiFi met me at the gate this morning, hoping I had a biscuit for her (I did). I’ve never seen her standing like that and realized she’s almost as tall as I am. She needs a pedicure, right?? Right now, she won’t even let me touch her collar. I’m hoping that continued treats and love will get both karakachans to the point that we can clip their nails. And change their tick collars. And, God forbid, get them into a vehicle for a trip to the vet. Right now, it’s house calls only. 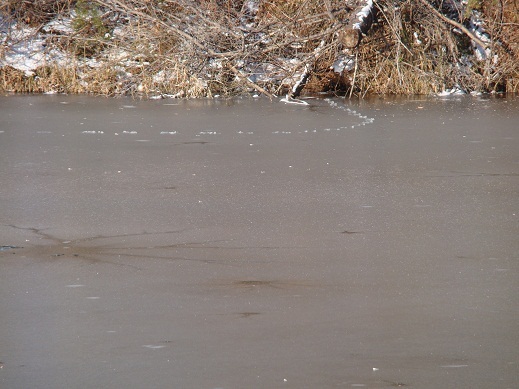 We’ve always known that the miscellaneous varmits who show up in our pond reside somewhere in the bank across our pond. Now, thanks to a frozen surface and snowy footprints, we know exactly where they have set up housekeeping. Good to know…. 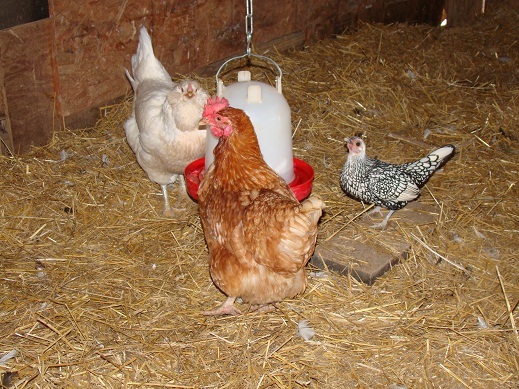 We swap our chicken’s waterer every morning. The frozen one gets replaced by a liquid one, and the frozen one comes into our mud room in the house to give it a chance to melt. The watery one’s arrival is much anticipated and heralded by a flurry of clucking and scratching. Nugget needs a little step to reach the water. She’s tiny.